Tim has replaced the rear leaf springs and has the bed hinged. Here are a few photos of the paint job. It's looking great! After speaking to the management team, we have decided to turn this into an internal, bb7 spare time project. I'm excited to be sharing the project and am looking forward to how this will shape the final outcome. In other news, the painting is complete and Tim is reassembling the truck. I'm still waiting on replacement leaf springs for the rear suspension. They are due today. Tim will install them, finish the sand blasting and then finish his portion. After that we will bring Stu to bb7 and squeeze him into the shop for the next phase. I started researching electric vehicles by talking to my brother Tim. He had converted an S-10 pickup truck several years ago. He gave me some internet links and some practical knowledge. His conversion used lead acid batteries so his range is fairly limited. While I was researching EV (electric vehicles) I started dismantling my truck. Fenders off, ICE (internal combustion engine) out. It had been a long time (35 years) since the truck was dismantled. Quite a lot of rust had settled in. A grinder came in handy to make short work of seized up bolts. Getting edumacated in EV has been difficult. There is so much stuff on the internet. Quite a bit of it is getting dated. Additionally, quite a few people converted their vehicles for very short trips. While this is pretty cheap, it doesn't serve my purpose which is to use it as a daily driver, April - September. Since my commute is about 40 miles round trip, I started looking at fancier solutions. I also started looking into body shops. Although I've become more skilled at building and repairing things over the years, I have also learned to realize when I'm in over my head. For the quality of restoration I wanted, I needed a pro. The first quote was $25,000! Yikes. However, I was then led to a much more reasonable body man. I have nothing but good things to say about Tim Everson. He is doing a bang up job. He has cut out all of the rust and welded in new metal. Dents are removed and he blocked the whole truck. It's looking great. Tim will be wrapping up his work in the next week or so. 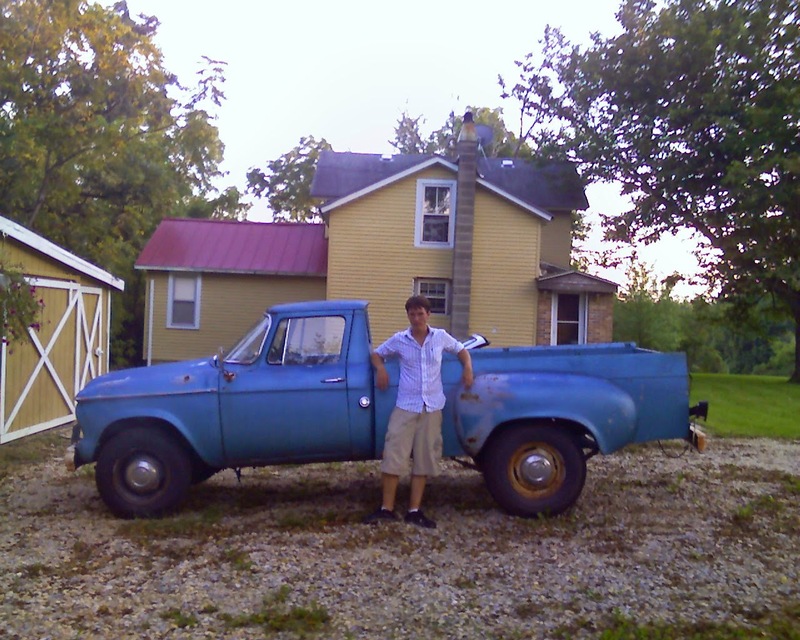 In November, my friend Juice & I brought my 1960 Studebaker Champ truck to its new home at Walnut Bank. After replacing the fuel pump and battery, it started right up, after sitting for five years in Juice and Judy's back yard. I drove it to Stoughton and back and by the time I was home it was smoking like crazy due to oil leaks and such. I backed it into the garage, opened the hood and pondered. 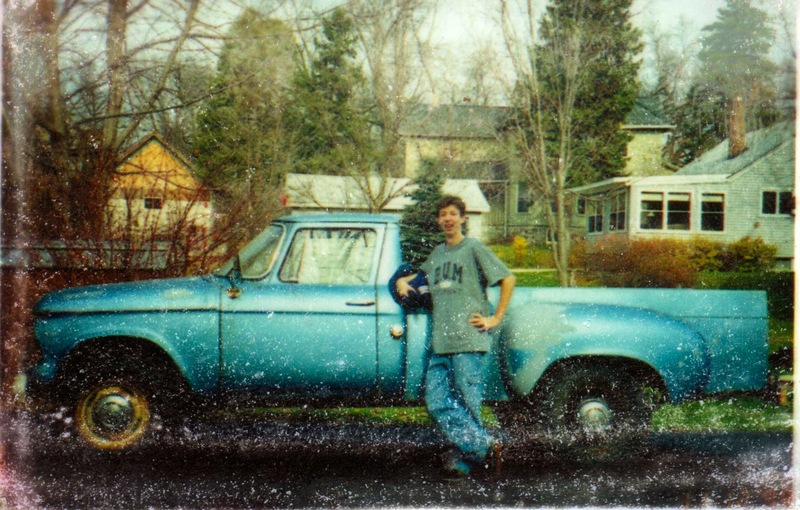 The truck and I have been together since the summer of 1977. I pulled it from the back lot of my families' International Harvester dealership in Bargersville, Indiana. The truck was a farm truck, rode hard, and put away wet. All the windows were broken, the floorboard was pretty much gone, the cab sagged, the brakes were bad. In short, it was perfect for a 19 year old kid. My buddy John and I fixed it up, the best that we knew how. I rebuilt the engine, replaced the brakes, new windows, sand blasted, painted, learned to weld and patched the floorboards. Being kids, we didn't really know what we were doing. We got 'er done, but it was a pretty crummy job. Over the years, I've fixed up several times. Each time a bit better. It's been stored in numerous barns. It's been up to its carburetor in a flood. When Adam turned 16, we brought it Wisconsin and fixed it up yet again. We replaced the clutch, put on new safer brakes and added seat belts (like that would help).